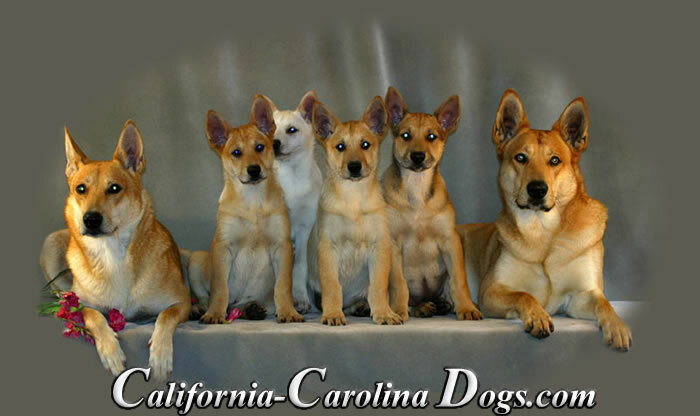 The Carolina Dog was discovered and named by Dr. I. Lehr Brisbin, a biology professor at the University of Georgia, at the United States Department of Energy's Savannah river site in South Carolina. This is a remote area from which the public have been excluded, and wild dogs that have lived there for centuries have had little opportunity to breed with domestic dogs. Brisbin noted that these dogs were almost identical in looks to the Dingo. Other scientists observed that the Carolina Dog's bone structure was very similar to the remains of Neolithic dog bones from Native American burial sites thousands of years old. This breed is thought to be a direct descendant of the ancient pariah dogs that accompanied Asians across the Bering Strait land bridge 8,000 years ago. 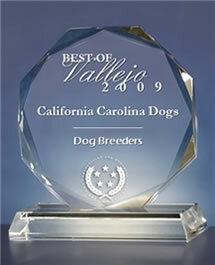 Carolina dogs make excellent watchdogs, yet are trustworthy and loyal to anyone who raises them properly. The dogs respond exceptionally well when given a clear leader, and their trainability is high. Many other breeds are so used to humans that their natural instincts to follow the alpha male are suppressed; not so with Carolina dogs. A good owner of a Carolina dog is an active owner who loves the animals, understands them, and respects their intelligence and social system. An article on Carolina Dogs in Smithsonian Magazine.